Those who know me know my occasional reference to the Chinese character 忍 - "ren" (or "nin" in Japanese) - meaning "to endure" or "to persevere". 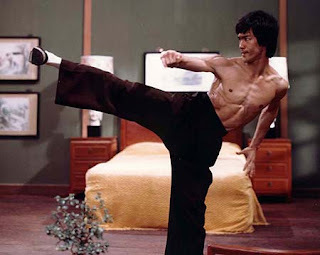 For me this character has special resonance with martial arts training. 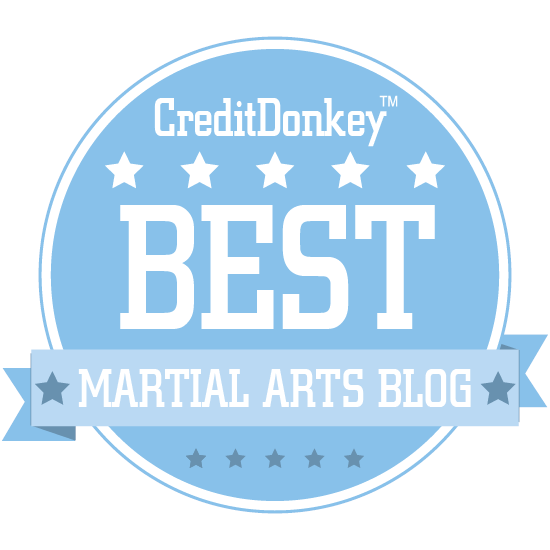 It reflects not only the years of blood, sweat and tears poured onto the dojo floor; it also reflects the psychological challenges, the fears, the disappointments. In one word it conjures all the barriers that have confronted me along my martial journey. Some of these I have overcome. Others have bested me. Yet, despite the latter, what is critical is this; I do not define myself by the moments where I lay defeated in a crumpled heap. I choose to define myself by the moment I picked my sorry self up again. 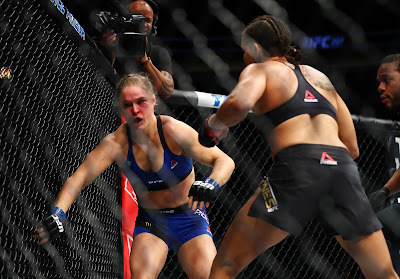 Some moments of defeat are almost too humiliating to confront. I let them loiter in the recesses of my mind, pushing them back whenever they try to intrude into my consciousness. I do so with the aid of my steadfast ally; the memory that I did not give up. I came back to fight another day. 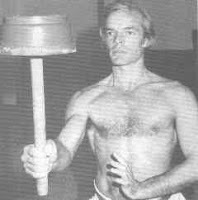 From my early days I remember my senior Sensei Dave Goodwin; a fearsome figure who was not given to levity or joviality. A former shotokan black belt who had joined my instructor's goju school, he had adapted quickly to our kata but relinquished none of his fearsome kime, his uncompromising attitude and his single-minded fury in attack. 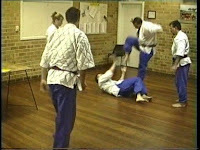 When, as a white belt, I ignominiously revealed to the whole class my ineptitude (caused by my sheer terror) at performing forward rolls onto the bare wooden floor, it was Dave Sensei who was asked to take me aside to "teach me". Dave took me out to the concrete; there I fell time and again upon a battered and bruised shoulder, sliding ever deeper into ineptitude; fear giving rise to injury, injury giving rise to greater fear, all in an endless downwards spiral. When I got home it seemed to me that I faced 2 choices; (1) quit or (2) learn how to roll, then go back to training in triumph. In fact, I did neither. I spent many an hour after school on my front lawn, willing myself into a forward roll - alternately crunching my shoulder or flipping onto my back and jarring my kidneys. I went back to training not with any sense of victory or accomplishment. I just went back. Gradually my rolls became better and less painful. Gradually the humiliation eased and then disappeared. One day mats appeared and we began to roll on them. I did not, at any point, return triumphant. I merely returned. I survived. I endured. I have come to regard this is as the true marker of martial spirit. One cannot always respond to defeat with a "all singing, all dancing" victory. In many cases, true victory lies not in triumph or valour, but in simple surivival. 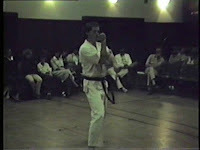 And so it was that for many years I watched as successive white belts who joined after me were elevated in rank - to green and brown and black - all surpassing my meagre achievements; all pushing ahead of me in line; all humiliating me in hard sparring. Most relevantly, I remember the many "thumpings" administered by my principal teacher, Bob Davies Sensei (we have addressed him as "Lao shi" since his time training in Taiwan). 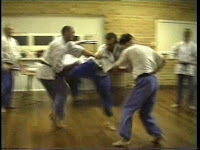 I can recall a particular occasion where, when grading for nidan, I was battered black and blue for a full half-hour. At the end he left me in a heap with the hopeful phrase: "Now when someone hits you in the street, you can say 'I've had better'". I retreated into a toilet cubicle wanting to let loose the torrent of tears pressing behind my eyes like steam in a pressure cooker - tears of shame, fear, anger. Somehow I could not. The tears never came. I reflected bitterly on my hopeless tactics; the desperate lunging headbutt when all else had failed (and which also failed spectacularly when my face butted Sensei's hammer-like fist). Or the desperate clinches which only meant that he would take me to the floor, where he would manipulate me like a doll, pinning my joints into impossibly painful, floor-slapping locks. At one point I was choked out, only to find myself "coming to" into a "ground and pound" with solid punches raining onto my throat (from which I escaped by somehow managing to sink my teeth deep into his big toe: "Good," he said). Or the couple of full-throttle kin geri (instep kicks) up into my groin - following which there was no respite in attack; he pressed on relentlessly and, Michael Jackson crotch-grabbing and all, I had to fight back. Perhaps it is truly fitting that the tears never came. Because I did more than fight back - however ineptly - during the "thumping". I endured. I endured because, at the very next lesson I was back on the floor. Sparring beyond exhaustion was, of course, obligatory under my former sensei. 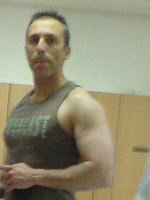 When I got back home I found an added challenge; for the first time in my life I experienced whole-body cramps. Not one muscle seemed exempt. I was in absolute agony. I had sweated so much that my electrolyte balance had been totally upset. My long-suffering "martial arts widow" ran to the kitchen to grab a bottle of Lucozade which I downed in one gulp through my locked jaws while lying like a wooden plank in the hot bath she had run for me. Then there was the 1990 "Decadal" gashuku... But that will have to be recounted another time. Many friends and martial arts colleagues have openly scoffed at my teacher's methodology of this "spirit training" as he called it. They have often asked what possible purpose or justification it could have had. Granted, it seemed extreme. However the answer lay/lies in the character 忍. I learned to endure, to persevere - depsite all obstacles. I discovered that on a purely physical level, you have no idea how your body will react when you are faced with both anaerobic and aerobic exhaustion. You only know what will happen after you've been there. Then there is the psychological aspect (if it is even possible to divorce mind and body - more on my disdain for Cartesian dualism another time). 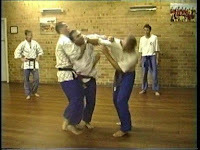 Exhibiting perserverence and fighting spirit in this context was what my instructor was looking for. I rather suspect that those who have scoffed at "spirit training" have never faced this kind of test. I think their scoffs hide an uncomfortable query lurking at the back of their mind: "How would I fare if I were faced with this kind of test?" I've seen people who seemed tough as nails crack under this kind of pressure (and fail a grading as a result or even quit training altogether). I've even seen people crack simply under the pressure of doing the push-ups required for a grading. I remember one student quitting with a disdainful tone after failing that particular requirement. As it happens this also served to expose a rather unpleasant, egotistical character that he had previously managed to hide from me, but which I subsequently ascertained was clearly in evidence whenever I wasn't around. 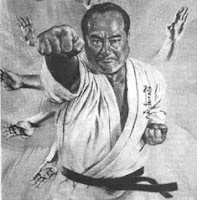 My instructor's view was that you could not be, say, a yondan (4th dan) without demonstrating that you not only had the requisite athleticism and technique but also the requisite level of fighting spirit/resolve/perserverence - ie. strength of character. 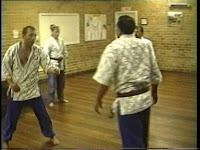 That was his criterion within his grading structure and I respect it and see its purpose in building a particular set of martial skills (related to civilian defence at its peak). My own requirements of black belts are not nearly so stringent. My instructor might think me "soft". Perhaps I am. On the other hand I think I just have a different concept of the right "balance". It seems to me that one doesn't need to push quite so close to the brink in order to know that a cliff is there. Regardless, physical requirements as well as "spirit" tests remain intricately bound up in my concept of what it means to be a "black belt" or any other grade for that matter. If someone isn't interested in attaining "fighting ability" then I also respect that. Even my own goals are really quite different today from those of years gone by. 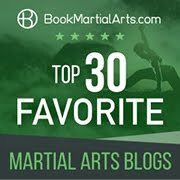 I see martial arts as being for everyone - not the relatively few in society who are capable of becoming elite fighting machines. 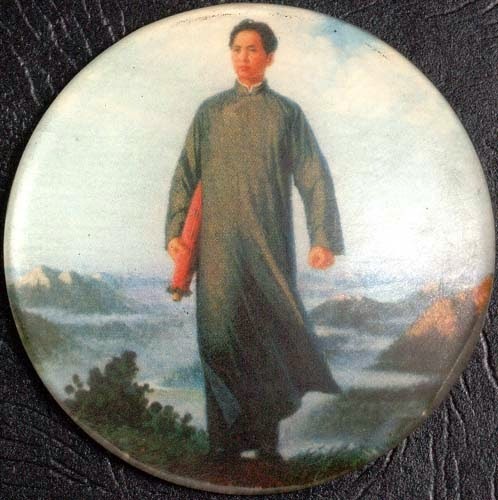 But if you wish me to give you a grade within our wu-wei dao civilian defence system, then you will have to demonstrate the requisite level of 忍. This element is as important in civilian defence as technique - perhaps more. 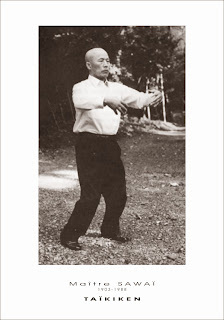 As Gichin Funakoshi said: "Spirit first, technique second". I happen to maintain a level of strength and endurance (as best I can) but I am personally not training under a grade structure. Accordingly, for me physical endurance and "spirit" training are not related to any requirement that might be imposed on me. 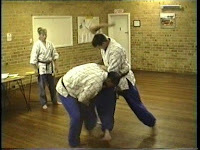 I last graded under my former instructor to yondan - just shy of godan - in 1996. Perhaps I might grade again some day - who knows? My present teacher Chen Yun-Ching Shifu doesn't award grades. Grading isn't my priority or goal, but I don't have anything against grade structures either. If I were to be graded by someone I would, no doubt, straighten my jacket and go once more unto the breach. 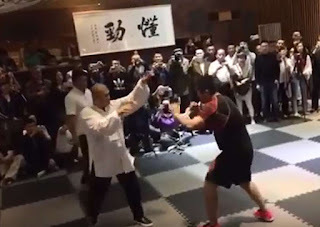 Howevery biggest test of 忍 so far has not come out of grading or any other form of martial arts training. Rather I remember lying in a hospital bed for 3 months following routine surgery that went dreadfully wrong. I remember feeling the full weight of the shame that comes out of not responding as you feel you could/should, ie. with bravery and stoicism. Rather I crumpled into nothing - a scrag of disconsolate negativity and panic. Little did I know all those years ago, sitting with boiling eyes in that toilet cubicle following my "thumping"; resting in the bathtub drinking Lucozade through clenched teeth; in fact, at any other time of my training life: little did I know that I could be quite so reduced in terms of pride, dignity and human worth - to myself and to those to whom I owe duties of responsibility. Even now I shudder and avert my mind from what I became (or what I have been revealed to be). Once again my only consolation lies in this: I came back onto the floor - in the literal and figurative sense. I'm still here. Should I venture once more into the abyss I will redouble my efforts. Even if I do not win triumphantly I will survive - and this time I will do so with greater dignity than before. This has been the biggest lesson I have learned from the martial arts. 1. I suppose I shouldn't be too hard on myself for my poor showing. I don't want to rely on excuses or anything, but there was the small matter of a fractured vertebra affecting my performance. 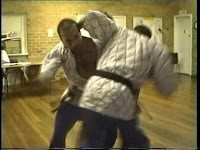 I am always amazed at the similarity of the martial arts experience...and its singularity. Growth is always in a spiral, revisiting experiences one thought one had overcome, and there they are again, grinning. Fear and desperation are forever lurking, as are hope and spirit. Your words ring so true. 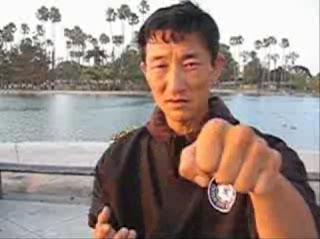 Martial arts are, in the end, a path to oneself. And this is what we share with others, the sometimes "bitter tea" of the human experience. This post is just simply great, Dan. This post struck a cord so deep in my spirit I have no words. I've long been fascinated by the things the human body can do...and endure. I'm only about 7 months into my journey, but I know so much more awaits. Your courage gives me courage. As both a martial artist and a writer I've become used to expressing my emotions in a very oblique way. This is one of the few posts where I have laid bare my soul for all to see, so I was wondering whether I ought to have been quite so open. Your very kind comment reaffirms my decision and is deeply gratifying; it is the role of any sensei to convey experience and it is the goal of any writer to elicit an emotional response. To do both at once is very rare, however I infer from your comment that I might just have done this! Thank you very much indeed. I was never satisfied with the way things were done, either in traditional teaching or traditional applications of theory. I always asked myself, "could it be done better", and the answer is, often or even always, yes. Do we teach the material the way we were taught, or do we teach the material based upon our current understanding of how to better cut out the irrelevant stuff and focus on communicating and transmitting the essentials? I think your training methodology is to be admired, Dan, even more so given how you yourself were trained. Every time I read this it moves me deeply. It sends a chill into my soul and brings tears to my eyes. I dearly wish to remember this lesson more often. How can I baulk knowing others give more than I to keep going? Your lessons inspire me. I feel I owe it to you, to what you stand for, to nin to care enough to endure. Thank you sincerely for sharing such honest, humbling lessons with those who would try to learn from them. You're very kind Xin. Thank you. It would be a shame to go through hardship without it having some benefit - to me and also (it seems) to others! Although I'm sure you've studied the character 忍 nin/ren extensively, I was reading Adeline Yen Mah's "Falling Leaves" (1997) and I came across a paragraph that seemed to be a beautiful summary of the character. 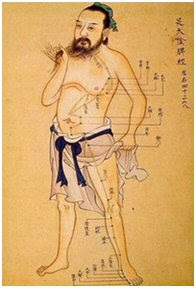 "Divide 忍 ren into its two components, top and bottom. The top component, 刀 dao means knife, but it has a sheath in the centre of the rapier 刃. The bottom component, 心 xin means heart. Combined together, the word is telling us a story. Though my son is wounding my heart, I shall ensheath the pain and live through it." Well done on the grading by the way.